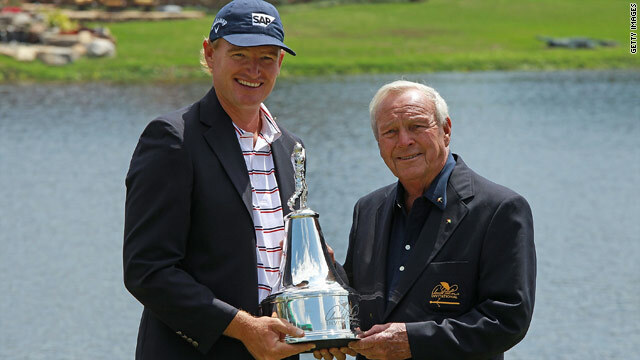 Ernie Els (L) is presented with the Arnold Palmer Invitational trophy by the man himself. (CNN) -- Ernie Els survived some nervy moments to secure his second successive Arnold Palmer Invitational title in Orlando on Monday. The South African's charge for the trophy was halted by bad weather on Sunday night, forcing play to be abandoned when he was leading by two shots with four holes left. Els recorded four pars to end his round on a total of 277 (-11) but had to rely on his powers of recovery to avoid dropping shots on the sodden course. He sank an important putt on 15 to save his par before putting his drive on the following hole into the trees. He regained control to prevent dropping a shot before chipping out of a difficult lie on 17 to make another par. American Kevin Na cut Els' lead to just one stroke on the 16th hole but his hopes ended when he left his par putt short on 18. "It was a tough finish for me," Els told reporters. "I've been thinking about these last four holes for 22 hours so it was nice to finally get on the golf course. "I kind of limped home but the work I have put in has started paying off, and obviously my short game is good. I got it up and down the last two holes." Els claimed the WGC-CA Championship in his last outing and heads into the year's first major, the Masters at Augusta in early April, in good shape.